January 16 marks Martin Luther King Junior Day, a national holiday that recognizes King’s legacy through community service initiatives. Some U.S. students and employees might have the day off, but they’re encouraged to use that time to give back and work with others. 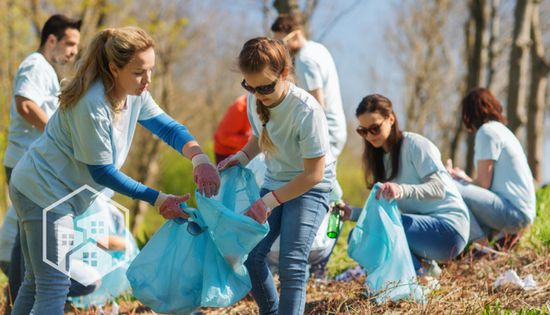 Before you choose your volunteer activity or head out to your project site, consider a few green tips that benefit your community and the environment. Volunteer for a local cause. By helping a local cause, you get to experience firsthand how your work directly impacts your city and community members. Consider selecting projects that involve community beautification, youth mentoring or animal care. Find a greener mode of transportation to the volunteer destination. Whether you’re riding the bus or carpooling with your friends, an eco-friendly trip to your volunteer site helps conserve gas and mileage for other uses. It also takes one extra car off the road during commuting hours! Be passionate about the cause. Whatever volunteer program you decide to participate in, find one that you’re passionate about. Be intentional with how you spend your time and energy and know that you’re making a difference! Want to volunteer in your city but not sure where to start? The following green organizations – as well as others throughout Texas – take volunteers on a regular basis. Enjoy the outdoors and embrace your green thumb by volunteering for the Fort Worth Botanic Garden. With more than 100 acres to manage, the garden welcomes individual and group volunteers to lend a hand around the grounds. From the rose garden to the perennial garden, volunteers have the opportunity to clean up 20-plus different spaces that house a variety of blooms. Tasks include watering, mulching and pruning. Some volunteers might get lucky enough to plant flowers! If you’re not interested in getting your hands dirty, there are alternative volunteer opportunities available. Teach an educational activity, organize the gift shop or greet visitors. Founded more than 20 years ago, Urban Harvest spends time encouraging organic gardening and healthy eating habits in the community. The Houston-based organization works to make sure that all city residents have access to fresh food by holding educational classes about canning, growing fruits and vegetables and living sustainably. Also, it supports about 100 community gardens that grow food for local shelters, provide a hands-on learning environment and add a touch of green space in Houston neighborhoods. Volunteers are needed for a number of the organization’s initiatives, such as community garden projects, farmers markets and youth educational sessions. Located in Austin, the Yellow Bike Project stresses the importance of using bicycles as a reliable form of transportation throughout the Central Texas area. Since 1997, the Yellow Bike Project has released thousands of bikes to the community. Better yet, locals and visitors can ride these recycled, repurposed bikes for free, according to its site. The organization also has local bike shops, where volunteers teach community members practical skills including bike maintenance and mechanics. The Yellow Bike Project has special programs designed for both children and adults, and joins forces with other local initiatives such as HONK!TX, Hope Alliance and the Special Olympics. Whether you’re interested in teaching others about bike care or organizing the shop, the Yellow Bike Project accepts all different types of volunteers.